Texas Sage is a native to Texas and Mexico and will tolerate limestone, sand, and clay soils as long as they are well drained. This plant is also heat, drought, and salt tolerant. Leucophyllum frutescens ‘Green Cloud’™ is a compact Texas Sage that was selected by the Texas Agricultural Experiment Station. 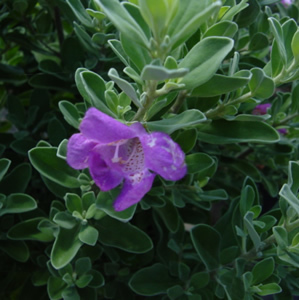 This Texas Sage can get up to 6’ tall but is more vigorous than other Compact Sages available. Green Cloud Sage will flower from late spring until fall, usually after rain, hence its other common name of Barometer Bush. The flower is bell-shaped and violet to purple in color. The foliage is more green than other cultivars which are usually silvery gray.